I finally finished my Artisan Vest. 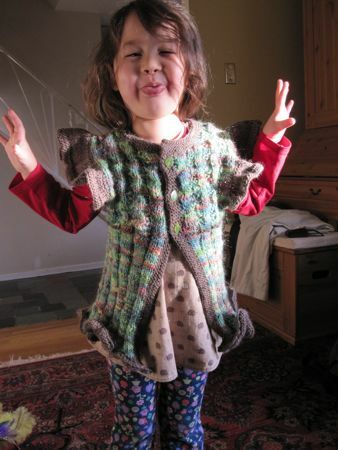 The knitting was done a couple of months ago, but I had trouble finding appropriate buttons. The yarn (Double Twist in Potpourri) is a brownish-gray-mauve that is absolutely beautiful but very difficult to match. Gold and brass tones were out of the question, and silver and pewter didn’t work either. I finally settled on some mahogany-colored simple leather buttons, and I think they look great. Unfortunately, my button placement was less than optimal. 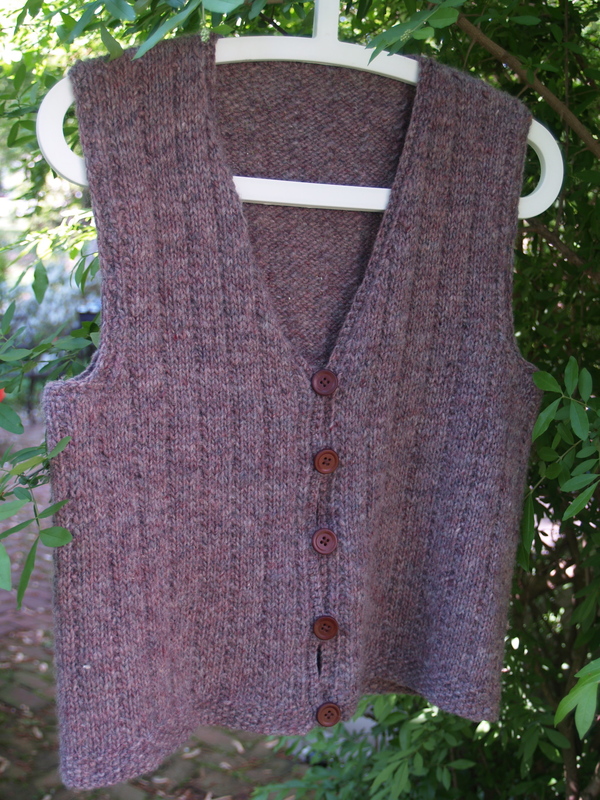 This vest has no significant button band; rather, the buttons go into little crocheted loops (which, along with all the edging, were crocheted by my husband). As I sewed on the buttons, I thought they look lined-up just fine, but once I finished I could see a little “gapping” between buttons. I think this is remedied by moving the buttons away from the edge a bit. I haven’t done this yet, though, because we’ve been having some unseasonably cool weather lately and I really wanted to wear this vest! Once the hot weather is here to stay, I’ll have all summer to tweak the buttons. The start of the vest journey. 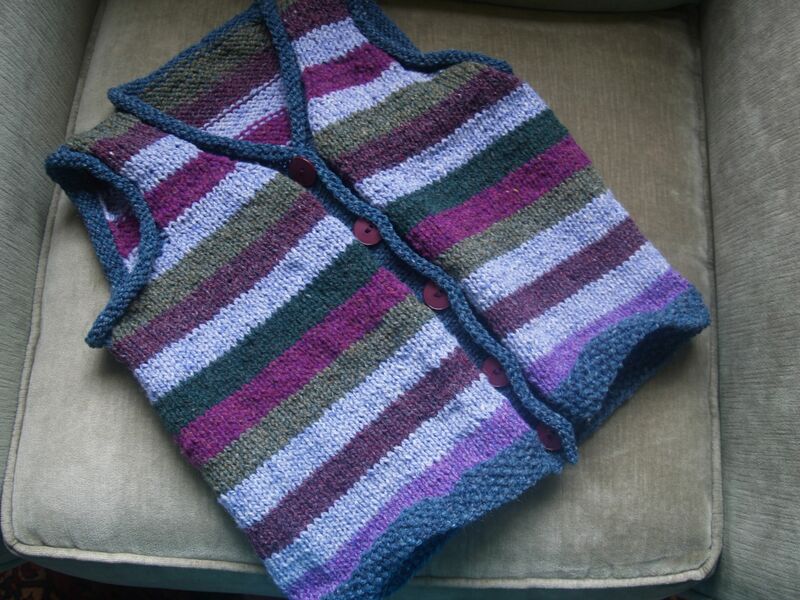 I finished the Artisan Vest. Sort of. 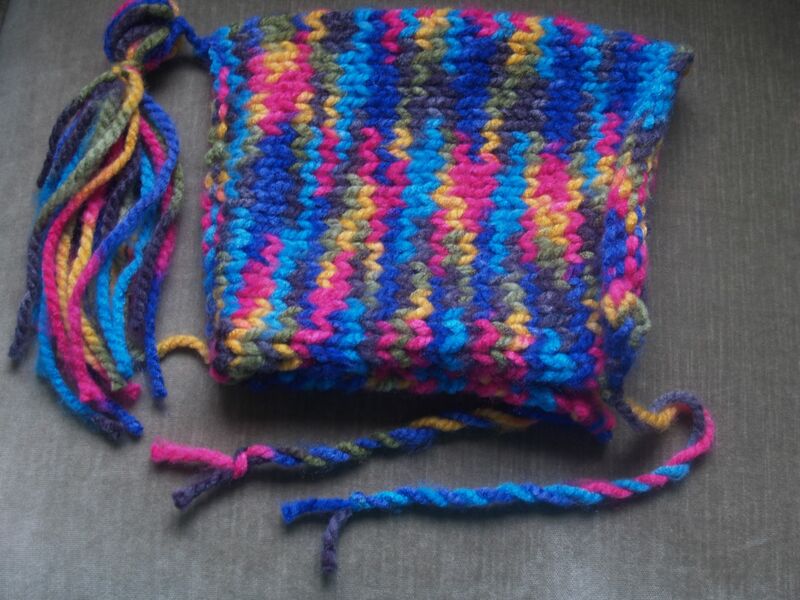 All of the knitting is done. 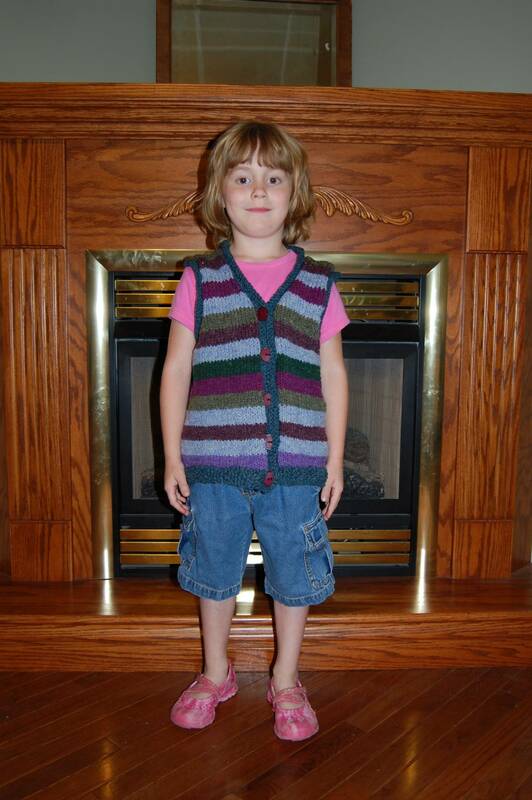 The only things left to do are weave in a few ends, block the vest, crochet the button loops, and attach the buttons. So here’s the new plan: I’m going to take out the armhole seed stitch and finish up the vest exactly as the pattern says to. My hunch is to trust that the people at Green Mountain Spinnery know what they’re doing when they write a pattern. And I think it’s likely that blocking will greatly improve the look of this piece (not least by stopping the edges from curling under). If I’m not happy with the result, the possible changes I’m considering can all be added to the vest (once the buttons are removed—easy enough to do). My friend Katie still thinks the seed-stitch edging is the best option, and is sure that picking up fewer stitches and knitting fewer rows the next time around will eliminate that “ruffled” look you get when there’s too much knitting trying to fit into a too-small space. My friend Beth thinks a simple crochet edging will tidy things up nicely. To be honest, I don’t really want to follow either of those suggestions. Not because they’re bad, but because I want to wear my new vest ASAP! Let’s start with something positive, shall we? Remember that disaster I mentioned a few weeks ago? 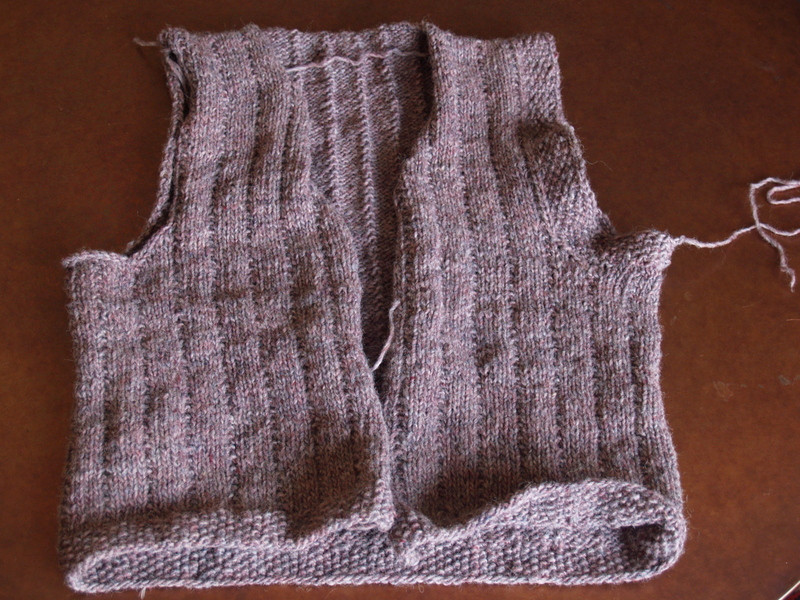 The vest that was supposed to have 160 cast-on stitches but somehow had 194—a fact I did not discover until I’d knit ten inches of it and was all set to divide the fronts and back? Well, I frogged the whole thing (which didn’t stress me out too much, honestly, because this knitting is not only quick but enjoyable) and—in a “get back on the horse that threw me” frame of mind—cast on again right away. I placed markers every twenty stitches, then counted the stitches between the markers six times, then counted the markers five times, then counted all the stitches on the whole thing another few times, just to be sure. Yup—160 stitches. Houston, we have liftoff! As you can see, the knitting is going well! With luck, I’ll have a finished object to show you all (and to wear!) very soon! And here’s the bad news: I regret to inform you that one project has bit the dust. Way back in August, I swatched for a wrap cardigan called Damson Wine. The pattern is from The Family Book of Knitting* (which is more like an extra-long special issue of a magazine), published by the folks who do the Simply Knitting magazine in the UK. I bought the book mostly for the knitted gnome pattern it contained, but also really liked this cardigan—so much so that I actually bought the yarn the pattern called for, Rowan Kid Classic. So I swatched succesfully (hooray!) and a couple of weeks ago finally got around to starting to knit the sweater. You know how some patterns have those “do this pattern until you have X stitches left, then K X stitches” lines? 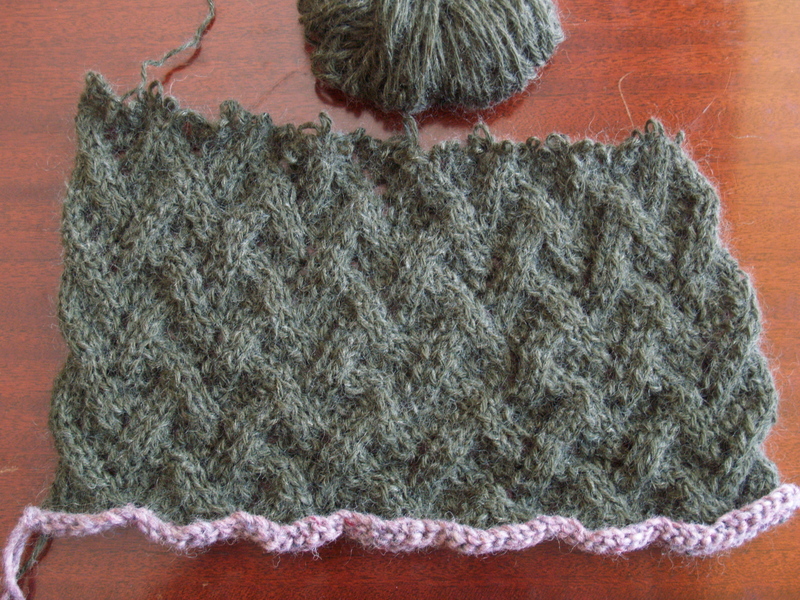 Every time I got to one of those points with this pattern, I had X stitches. Wow! I was feeling pretty good about this! And then I got to where you start the raglan decreases. And I got stuck. I simply could not make it work. I kept ending up with the wrong number of stitches. I looked online for help and found nothing. Not a single person on Ravelry has knit this pattern (at least, not a single person on Ravelry will admit to knitting this pattern). Simple googling yielded nothing but sites where the pattern is for sale (usually listed in the contents of the book) and my own original post about it. My friends said that it would be possible to figure out the math of each line of the pattern, but that would be a headache. And they were pretty sure I’d be all set to tear out my hair when it came time to put the thing together, because the pattern yielding some pretty lousy seaming points. So I’ve decided to bag it. 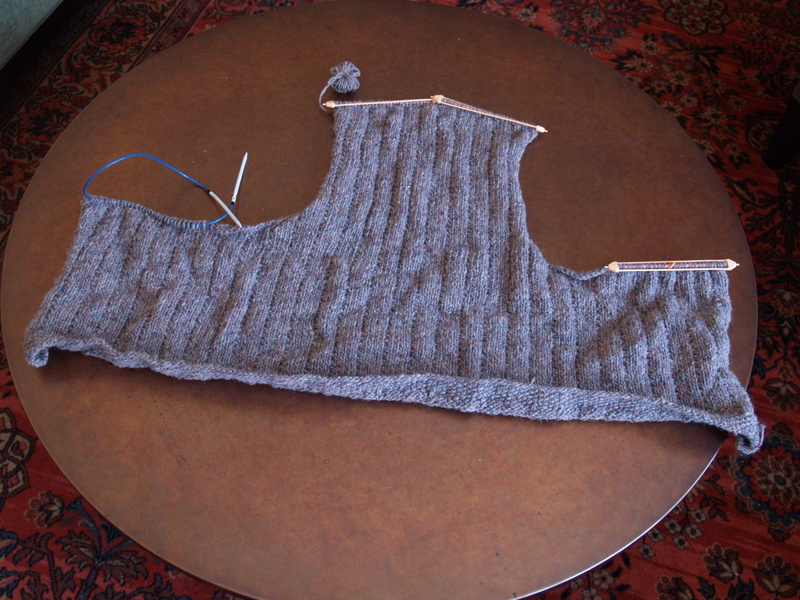 For me, knitting is supposed to fun, and thinking ahead to the amount of cursing all that math and seaming up will inevitably produce, this cardigan doesn’t seem like a fun project. I’m going to frog this sucker and move on. 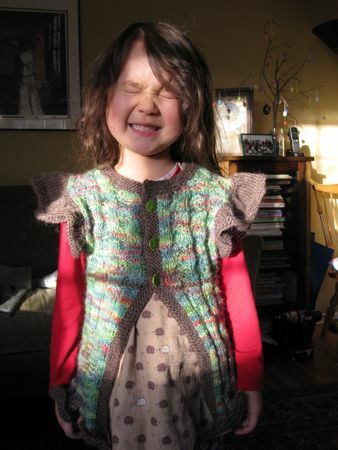 This was my first time knitting with Rowan Kid Classic, and I really enjoyed working with it. So now I’m trying to think about what to do with seven balls of this stuff. Should I try the Hourglass Sweater? Something else? I’m open to suggestions! *This book is called The Bumper Book of Knitting in the UK. That title is way cooler than the one on the book I bought. Why is it that American prints of UK works always get the lame titles? Argh.